The view from the back of the string section during a break. The studio is Futura Productions (a converted Masonic meeting hall), in Roslindale, MA. Introduction: "I was wondering if you were interested..."
Audio Files: "Night and Day" complete mix, plus a short tutorial on microphone placement and mixing in a big, live room. "I was wondering if you were interested..."
"I am the founder and director of the 18-piece Beantown Swing Orchestra (www.beantownswing.com), based out of Boston, and I was impressed by your article on recording big bands. We are looking to record our first album of original arrangements of popular and original songs, and I was wondering if you were interested and available for hire to record and process it. " 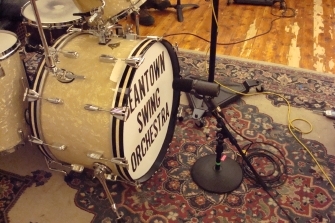 As it turned out, Frank was planning to record not just the core big band that was the Beantown Swing Orchestra, but to include featured vocalists and a large string section as well. The strings were needed, as a number of the arrangements would be reconstructions of charts that had been written for Frank Sinatra by Nelson Riddle and other arrangers. In short, Frank Hsieh was asking me to recreate the studio sound of Frank Sinatra's classic recordings of the late 1950's and early 1960's--recordings that I had analyzed and praised in my 1997 essay. 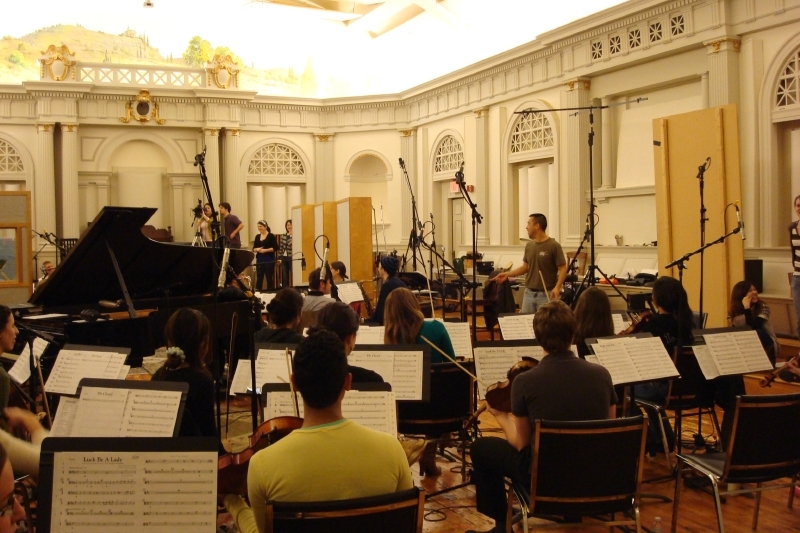 Our first task was finding a suitable studio for recording up to thirty-one musicians, all at once in the same room. Most modern studios do not have a sufficiently large, acoustically suitable main tracking room for such a session, so a number of otherwise good studios were ruled out immediately. Frank was willing to consider almost any location that the Beantown Swing Orchestra normally played in, which gave us options as far away from their Boston home base as Vermont and New Hampshire. We eventually settled on two studios: Guilford Sound in Guilford, Vermont and Futura Productions in Roslindale, Massachusetts--a suburb of Boston, complete with a commuter train line station across the street from the studio. 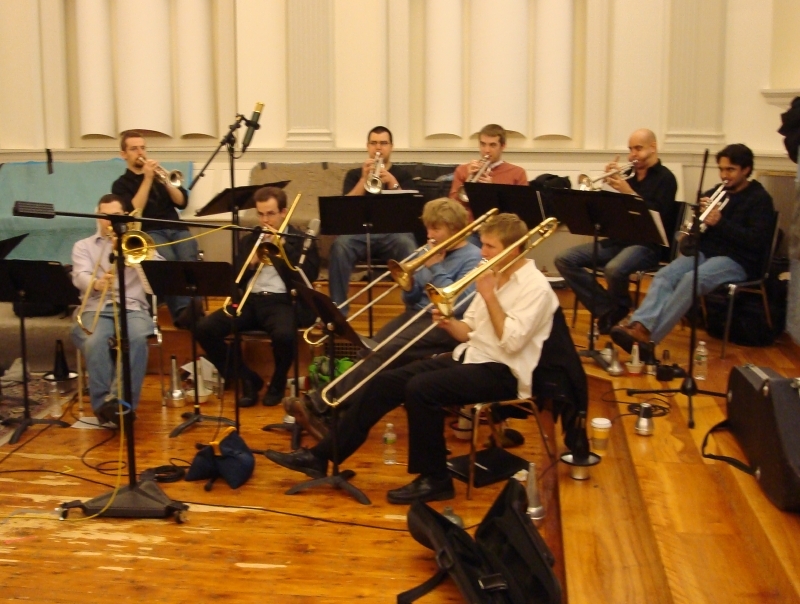 We did sessions in both studios, but it was Futura that had a main room large enough to accommodate the big band and string section in a single session. 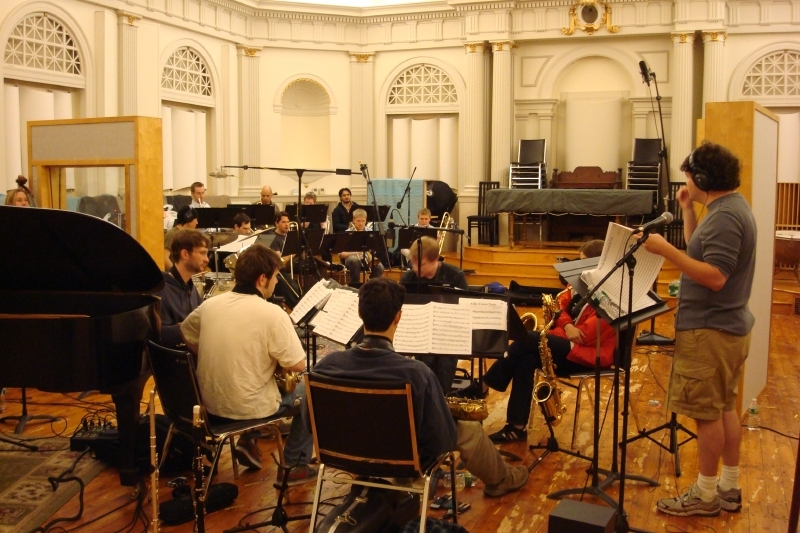 So it was that on February 5, 2011, we had our first recording session with the big band, fourteen string players, vocalist John Stevens and a video recording team from Boston College, all arrayed in a converted Masonic meeting hall with rather live acoustics. "The record jacket cover [for the album] featured a photo taken at the session that, apart from some staged details, shows us the studio setup. Sinatra's position in the photo is obviously for the photographer; I doubt that the engineers would have had him stand in front of the brass section! But for the rest, the conservative section-by- section pickup is evident: the brass to the right in two rows, picked up by a single mike [probably a Neumann U47], the saxes to the left, grouped around a single RCA 44, the rhythm section instruments roughly in the middle with single mikes for each instrument, and the strings some distance to the left with perhaps two mikes on them." Below is a scan of the original LP album cover, and if you click on the image, a larger image will open in a separate browser window, allowing you to see the photo in detail. While you are looking, notice that there are no gobos (partitions) between any of the musicians, and there are no headphones visible--evidently everyone is relying on the acoustic sound in the room to hear each other, as they would in live performance. Frank Sinatra recording with Nelson Riddle and his orchestra, 1960. Click on the image to open a larger picture in a new window. The working method of the Capitol engineers appears to be to treat the brass and reeds each as individual sections, and to pick each of them up with a single, well placed microphone. This preserves the balance and instrumental blend within each section--the players, left to their own devices, will balance themselves, based on what they hear in the room. In a stereo mix, the sax microphone is the main left pickup and the brass mike is the main right pickup. The various rhythm instruments can be heard in the horn section microphones, but it is the spot microphone on each rhythm instrument that defines where that instrument is placed in the stereo picture and gives it the proper amount of presence. Next we see my layout plan for the Beantown Swing Orchestra in Futura's tracking room. I followed the setup depicted on the Sinatra album cover pretty closely. There are also some differences--I placed a gobo between the acoustic bass and the drums for example. (Experience has taught me that cymbal leakage into a bass spot mike can be a problem, so taking measures to reduce that leakage is worthwhile.) There are also differences in the rhythm section miking--there was no such thing as an acoustic bass pickup in 1960, nor had the D.I. box been invented. Nor was it customary to place a separate mike on the kick drum of the drum set back then--the combination of an overhead spot and leakage of the drums into other mikes was considered sufficient in 1960. Plan view of the band layout in the studio. So far as I know, Frank Sinatra sang in the same room as the band in 1960, though not in the position depicted--he was probably out of the picture, in line with conductor Nelson Riddle, with the dead side (the null in the cardioid pattern) of his vocal mike pointed at the band. I tried something similar with John Stevens, but his vocal mike picked up too much band leakage, so he was banished to a vocal booth off to the side of the main room. Here is a link to the setup sheet, listing the microphones used in the session and other information. In 1960, a sax soloist would probably just stand up and play closer to the sax section mike. I chose to provide spot mikes for solos and for instrumental doubles like flutes. In part this reflects changes in equipment--these days for a studio to have 20 or more microphone input channels available is common. In 1960, 12 channels was considered a lot for even the biggest facilities. The tube circuitry of the day took up a lot of space and generated a lot of heat. Because of this, mixing consoles with high channel input counts were rare until the introduction of transistorized circuitry in the mid-1960's. It is likely that, for "Sinatra's Swingin' Session", the Capitol engineers were already close to maxing out their mixing console--they simply did not have the inputs to spare for extra microphones for horn solos and the like. The abundance of inputs at Futura allowed me to use six spot mikes for the string section, in addition to three overall string microphones. Futura's main room is smaller than Capitol Records, Hollywood, and the acoustics are more live. Studio owner John Weston wanted to use his room for classical chamber music recording, which would benefit from a live ambience. This makes it a very nice sounding room, but it reduces the amount of isolation one can achieve between microphones. 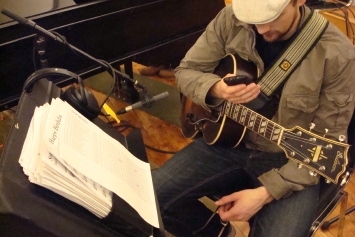 I was concerned that the overhead string mikes would pick up too much of the big band, and I was right--I ended up using just the string spot mikes in most of my mixes. I did try and reduce the liveness of the room acoustics by placement of gobos and "soft goods" (carpet, packing blankets, etc.) around the band. This had some effect, but I would have needed much more materials than were available to really damp down the room. In 1960 the Capitol engineers used what were considered the best available mikes of the time. The only "vintage" mike we see in the Sinatra album session photo is the RCA 44 ribbon mike (sax section), which had been introduced in the mid-1930's. Newer mikes include the Neumann U47 (in front of the brass section), the Telefunken ELAM 251 (I think that's what Sinatra is singing into) and the Altec M21 "coke bottle" omni condenser (the spot mike over the drum set). I admit that my choice of microphone for the acoustic bass is a bit unusual: the Countryman Isomax II miniature condenser--essentially a lavalier mike with a cardioid pattern and extended bass response. I use the tie clip that comes with the mike to clip it to the low E string, just below the bridge of the instrument. I was shown this technique by John Guth back around 1989, and I still use it because it provides good sound quality, with better isolation than most bass miking techniques. Should we record live to 2-track or record to multi-track? Should we record to analog tape or straight to a digital format? The first item was not hard to decide: the ability to correct balance and sound problems afterwards that multi-track recording would offer was a definite plus, given my lack of experience recording this band in this studio. 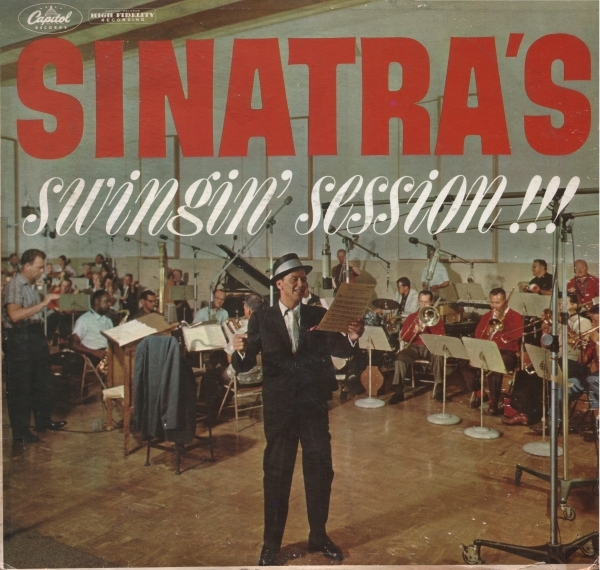 It is true that the Capitol studio engineers recorded Sinatra with Nelson Riddle direct to 3-track analog tape, but they also had the experience of years of similar sessions in their Hollywood studio to refine their techniques. I was taking a bit of a gamble in assuming that the same techniques would work for me in a different room with different performers. As for the digital versus analog argument, I have long had the opinion that you can make good recordings either way, provided you take care to respect the individual characteristics of each system. What swayed the balance was mostly practical considerations: using John Weston's Pro Tools rig for the initial recording gave me digital multi-track sessions that I could then take back to my familiar home studio and mix on my own Pro Tools system. Further, I already had extensive experience in mixing large Pro Tools sessions "inside the box" and knew that good quality results could be obtained that way. I used very little signal processing at the recording session, whether outboard or with plug-ins. We did provide a headphone mix for the rhythm section, for John Stevens and for musical director Danny Fratina. As part of this headphone mix, we did use a reverb plug-in. We also used reverb plug-ins for rough mixes done during the tracking, and that reverb was printed to separate tracks. In the end, I did not use any of that reverb, choosing only to use a medium hall reverb plug-in (a Waves IRL convolution reverb, for the record) on John Stevens' voice during mix-down. No reverb was used on the band--all the ambience there is actual room sound at the recording session. Then there is the matter of compression: I did put John Stevens' voice through a Summit tube limiter at the session, with the threshold adjusted for just a little bit of control. No other compression was used during recording. During mixdown, I again used compression on John Stevens' voice, this time with a Waves C1 compression plug-in, adjusted for upward compression. This means that below a rather low threshold point (about -35 dB), the signal would be gently boosted. The idea was to keep the softer details of John's singing from being masked by the band, while leaving his louder dynamics unaffected, and it worked nicely--it is a very transparent way of controlling dynamics. There were also a couple of tunes when I used some compression on the acoustic bass, and some horn solos (mainly trumpet or trombone) benefitted from some limiting. And I used a little EQ here and there (the Waves Q-10), usually for minor tweaks to the bass or a solo instrument. This is very light use of processing by today's standards, but it wasn't necessary to do more--the sound was already there, due to the use of good microphones, picking up good performances in an acoustically appropriate room. is only for trombone solos. The Coles 4038 at the right of the trumpets is for trumpet solos. The sax section, with musical director Danny Fratina. 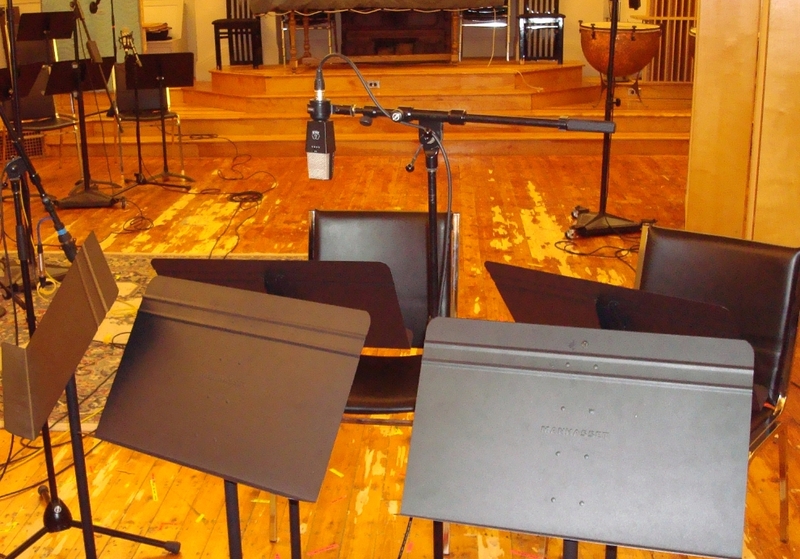 The AKG C 414 B-ULS can be seen just over the sax music stands, in the middle. A clearer view of the sax mike setup. 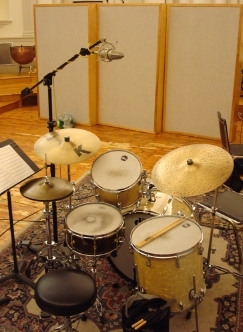 Two views of the drum microphones. Schoeps small diaphragm condenser mike on the guitar. 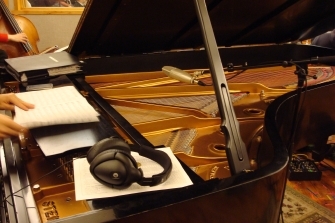 Shure KSM-44 in the piano. 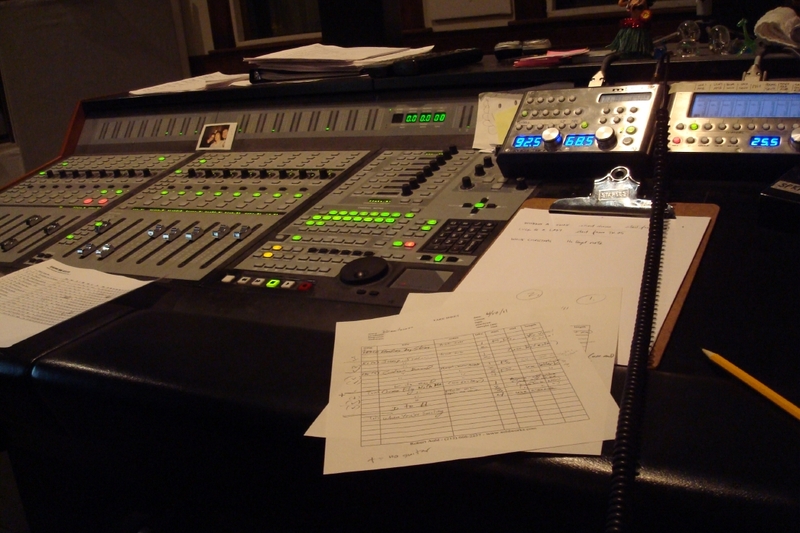 The Digidesign ProControl console--engineer's point of view. The first audio file is of the final mix of "Night and Day" (composition by Cole Porter, arrangement by Nelson Riddle), as recorded by the ensemble on Feb. 5, 2011. John Stevens sang at this session but overdubbed some of his vocal later. The final mix uses both live and overdubbed vocal takes. This mix is before any CD mastering was done and so has a wide dynamic range, with no overall compression. 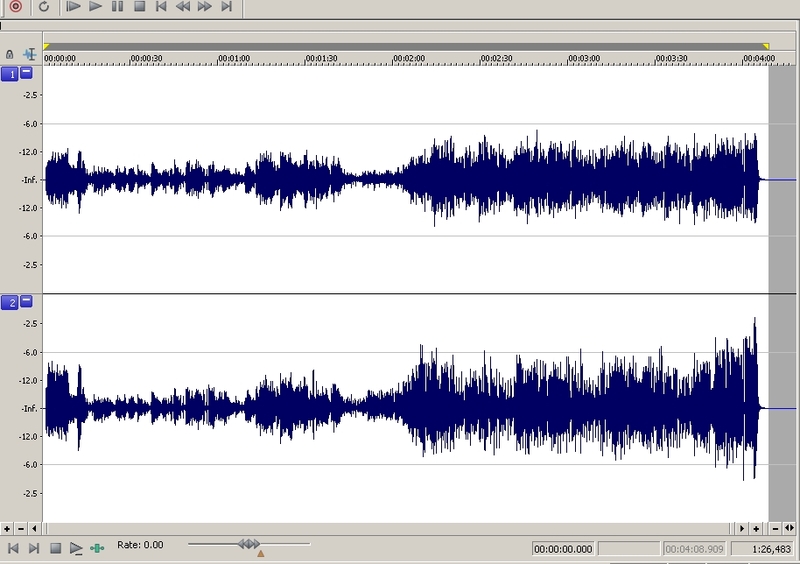 Go here to see a screen shot of the mix in Sound Forge 9, showing the dynamic profile over time. In the second audio file, I use the original Pro Tools multi-track session of the same recording and isolate various tracks to demonstrate how the different microphones contribute to the final mix. Narration is included, explaining each segment during this eight minute tutorial. Night And Day: tutorial, MP3 file demonstrating various microphone setups from the recording session. The recording features a wide stereo spread that sounds wonderful on loudspeakers, and the clear divisions between instrumental sections, the way little details of the arrangements are highlighted but never distract--well, this is how a recording of this kind should sound. Only a slight edginess in the treble and a bit of tape hiss give away the recording's age. Of course, I cannot claim to be unbiased. For what it is worth, I think the Capitol engineers achieved somewhat better definition of the sound of the band in that album, while my effort sounds a little diffuse by comparison. I attribute this mostly to the difference in acoustics between the two studios--Capitol Records Hollywood is a slightly drier room, which the engineers compensate for by adding in a bit of reverb from their famous echo chambers. The site of my recording, Futura Studios, is rather more live, to the point where I felt no need to add any reverb to the band sound. The question of the vocal recording tends to be obscured by the difference between the singers: no one else is Frank Sinatra. It is obvious that John Stevens has a great love for Sinatra's legacy and sings his repertoire with care and respect. The means I used to record John were the same as have been used to record Frank Sinatra and a great many other fine singers over the years: a large diaphragm condenser microphone with tube electronics and a little bit of dynamic compression, carefully applied. With a good singer like John Stevens, that is all you really need to do. Finally, I should mention that Frank Sinatra's own recording of Cole Porter's "Night and Day" was made in 1956, before Capitol began recording him in stereo. It is a good monophonic recording, but my modern stereo remake does allow you to hear more of the details of Nelson Riddle's arrangement. My thanks to John Weston, for putting together his studio Futura Productions, certainly one of the finest large rooms for recording in the New England area, and for his considerable engineering talents, which were at my disposal during the Beantown sessions. I also must thank Frank Hsieh, not just for hiring me, but for having faith that the recording method I suggested would work, for his fine musical judgement and for his organizational abilities, which were invaluable in seeing this recording project through. 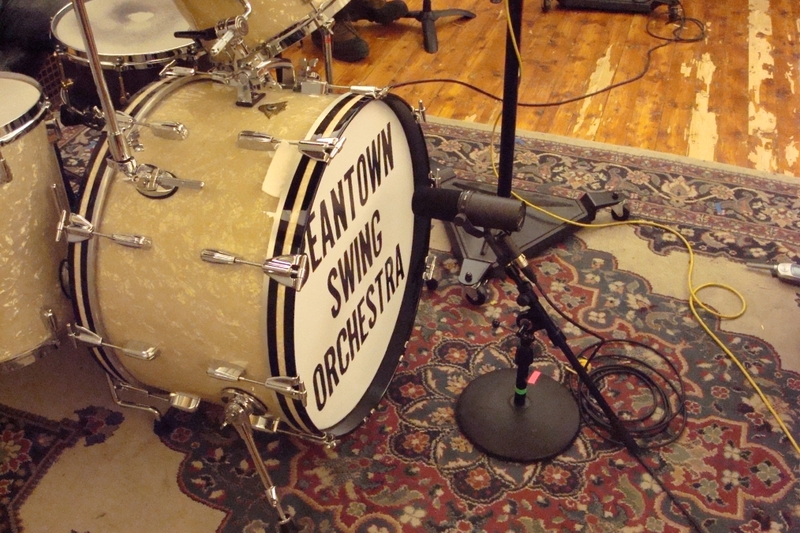 And finally, I must give credit to the musicians of The Beantown Swing Orchestra, who in the course of three recording sessions in two studios laid down tracks for three different albums to the complete satisfaction of all concerned. They are all young musicians in their twenties, and they can really play.